Our author’s grandfather John Gellibrand died at Paul’s Cray, Nov. 5, 1558.
he probably received the rudiments of his education in that neighbourhood. He was sent to Trinity-college, Oxford, in 1615; and took his first degree in arts, in 1619. 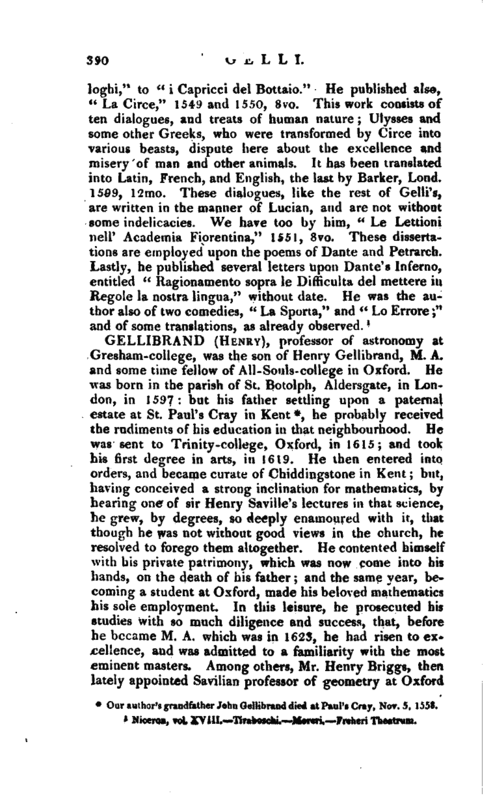 He then entered into orders, and became curate of Chiddingstone in Kent; but, having conceived a strong inclination for mathematics, by hearing one of sir Henry Saville’s lectures in that science, he grew, by degrees, so deeply enamoured with it, that though he was not without good views in the church, he resolved to forego them altogether. He contented himself with his private patrimony, which was now come into his hands, on the death of his father; and the same year, becoming a student at Oxford, made his beloved mathematics his sole employment. In this leisure, he prosecuted his studies with so much diligence and success, that, before he became M. A. which was in 1623, he had risen to excellence, and was admitted to a familiarity, with the most eminent masters. 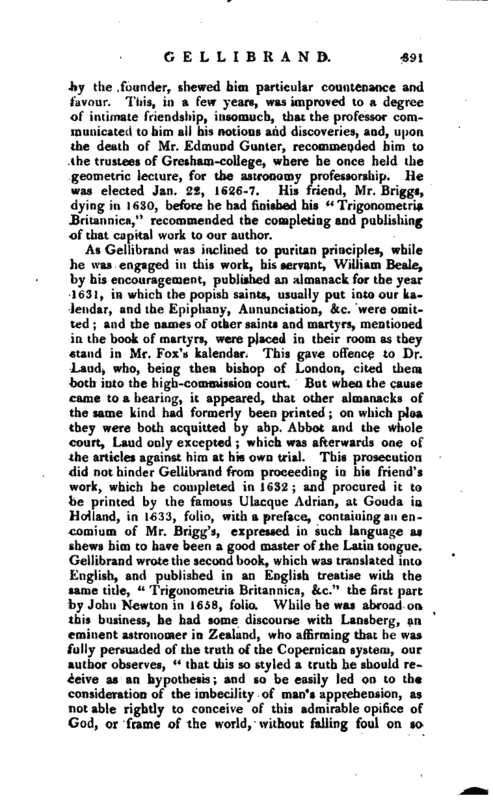 Among others, Mr. Henry Briggs, then lately appointed Savilian professor of geometry at Oxford | by the founder, shewed him particular countenance and favour. 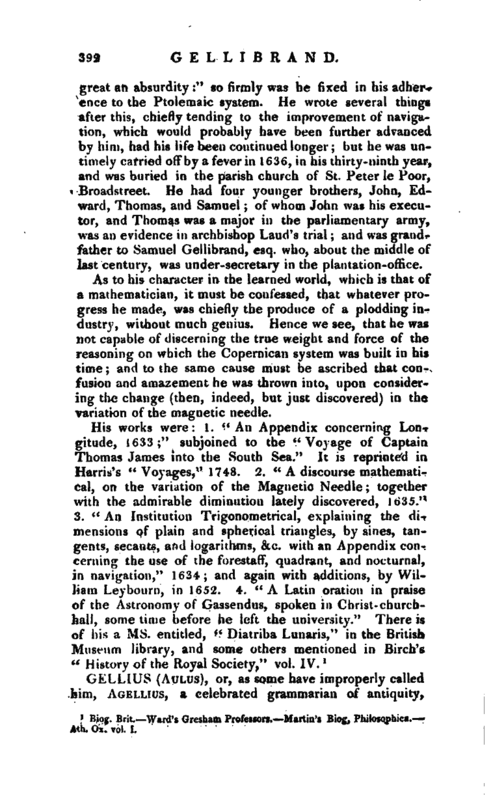 This, in a few years, was improved to a degree of intimate friendship, insomuch, that the professor communicated to him all his notions and discoveries, and, upon the death of Mr. Edmund Gunter, recommended him -to the trustees of Gresbaio -college, where he once held the geometric lecture, for the astronomy professorship. He was elected Jan. 22, 1626-7. His friend, Mr. Briggs, dying in 1630, before he had finished his “Trigonometria Britannica,” recommended the completing and publishing of that capital work to our author. As Gellibrand was inclined to puritan principles, while he was engaged in this work, his servant, William Beale, by his encouragement, published an al manack for the year 1631, in which the popish saints, usually put into our kalendar, and the Epiphany, Annunciation, &c. were omitted; and the names of other saints and martyrs, mentioned in the book of martyrs, were placed in their room as they stand in Mr. Fox’s kalendar. This gave offence to Dr. Laud, who, being then bishop of London, cited them both into the high-commission court. But when the cause came to a hearing, it appeared, that other almanacks of the same kind had formerly been printed; on which plea they were both acquitted by abp. Abbot and the whole court, Laud only excepted; which was afterwards one of the articles against him at his own trial. This prosecution jdid not hinder Geliibrand from proceeding in his friend’s work, which he completed in 1632; and procured it to be printed by the famous Ulacque Adrian, at Gouda in Holland, in 1633, folio, with a preface, containing an encomium of Mr. Brigg’s, expressed in such language as shews him to have been a good master of the Latin tongue. Geliibrand wrote the second book, which was translated into English, and published in an English treatise with the same title, “Trigonometria Britaonica, &c.” the -first part by John Newton in 1658, folio. While he was abroad on this business, he had some discourse with Lansberg, aa eminent astronomer in Zealand, who affirming that he was fully persuaded of the truth of the Cop^ernican system, our author observes, “that this so styled a truth he should receive a an hypothesis; and so be easily led on to the consideration of the imbecility of man’s apprehension, as not able rightly to conceive of this admirable opifice of God, or frame of the world, without falling foul on so | great an absurdity:” so firmly was he fixed in his adherence to the Ptolemaic system. He wrote several things after this, chiefly tending to the improvement of navigation, which would probably have been further advanced by him, had his life been continued longer; but he was untimely carried offby a fever in 1636, in his thirty-ninth year, and was buried in the parish church of St. Peter le Poor, Broadstreet. He had four younger brothers, John, Edward, Thomas, and Samuel; of whom John was his executor, and Thomas was a major in the parliamentary army, was an evidence in archbishop Laud’s trial; and was grandfather to Samuel Gellibrand, esq. who, about the middle of last century, was nnder-secretary in the plantation-office. As to his character in the learned world, which is that of a mathematician, it must be confessed, that whatever progress he made, was chiefly the produce of a plodding industry, without much genius. Hence we see, that he was wot capable of discerning the true weight and force of the reasoning on which the Copernican system was built in his time; and to the same cause must be ascribed that confusion and amazement he was thrown into, upon considering the change (then, indeed, but just discovered) in the variation of the magnetic needle. 1 Bioff. Brit. Ward’s Gresham Professors. Martin’s Biog, Philosophies. —Ath. Ox. vol. I.